On June 28, 1911, the Nakhla meteorite fell to Earth at approximately 9 a.m. in the Nakhla region of Alexandria, Egypt. Many people witnessed its explosion in the upper atmosphere before the meteorite dropped in about 40 pieces totaling 22 pounds; the fragments were buried in the ground up to a meter deep. In August 1911, the Smithsonian received two samples of Nakhla; in 1962, it received the 480-gram piece of the meteorite shown in this photograph. By the 1970s, the Smithsonian had acquired a total of 650 grams of Nakhla’s fragments. 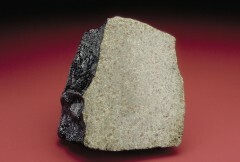 Nakhlites, Martian meteorites named for Nakhla, are igneous rocks that are rich in augite and were formed from basaltic magma about 1.3 billion years ago. Their crystallization ages, compared to a crater-count chronology of different regions on Mars, suggest the Nakhlites formed on the large volcanic regions of Tharsis, Elysium or Syrtis Major Planum. It has been shown that the Nakhlites were suffused with liquid water around 620 million years ago and that they were ejected from Mars around 10.75 million years ago by an asteroid impact. They fell to Earth within the past 10,000 years. This item is one of 137 million artifacts, works of art and specimens in the Smithsonian’s collection. It is on display at the National Museum of Natural History.